What the Ron Passant is this all about? The answer is surely that no, Arimaa is not the new chess. 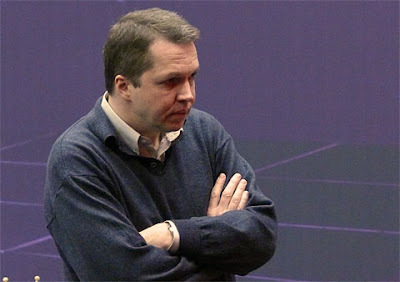 Designing a game to be more or less computer-proof -as Arimaa seemingly is- does not imply that it will overtake the popularity of chess. Sub-aqua sumo wrestling is computer-proof, but certainly no rival to chess - although I believe Nigel Short is a fan. And to answer Rocky's other questions, then yes: I remember playing Arimaa several years ago, and I didn't feel anything like the hook that plunged into me for life the first time I picked up a chess piece. So what is next generation chess? Had I been a betting man, then a few years ago I'd have placed a wager on Kung Fu Chess. Kung Fu Chess? I hear you ask. Never seen that on ICC. What's that? Thus in this diagram, the queen on d8 will be able to move again before the rook on c8, which is probably bad news for white. 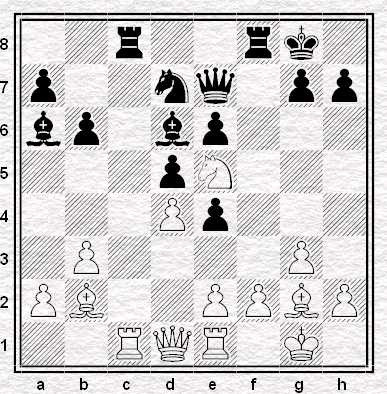 Oh, and in this diagram several pieces are still in motion, such as the bishop not quite on g5. The time it takes each piece to travel is also agreed before the game. 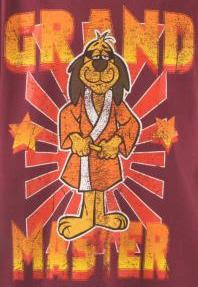 So why would I have bet on Kung Fu Chess to be the Next Big Thing? Well, the game play of Kung-Fu Chess is extremely exciting, simple to understand, and difficult to do well - at least, I hope it's difficult, because I'm very bad at it. 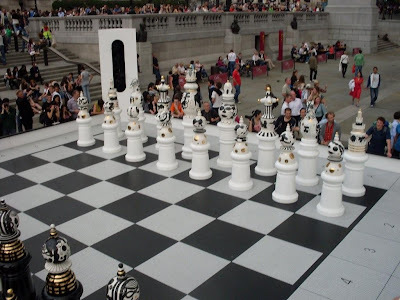 The game is unique to the internet, and thus there are no issues of purity and properness as there are with playing chess-actual online. It is entertaining to spectate and very quick to play; I would expect non-players to enjoy watching it a lot more than non-players seem to enjoy watching real chess. Fortunately, I'm not a betting man. The game seems never to have caught on, and the original website (http://www.kungfuchess.com/) now contains nothing but a one-line advert for MTV. It has to be said there were always problems with the original website. One was the annoying theme music that never stopped playing. 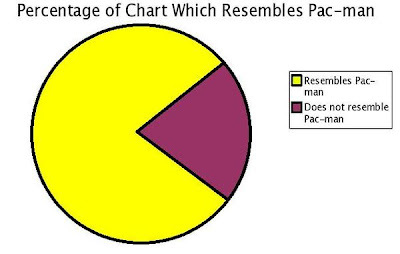 And, unsociably, it only worked in internet explorer. I have a distant memory of some kind of malware problem too, although wikipedia says otherwise. Tempted by Tempest? It'd be nice if the game did catch on, but that will probably only happen if it's incorporated into the ICC or the playchess server. 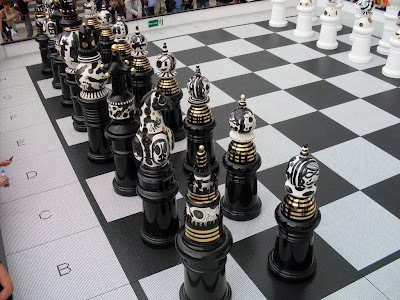 In the meantime, there's only one game that's the new chess, the next gen chess, the next next-gen chess. And that game is - chess. The French sculptor Germaine Richier stopped me dead in my tracks at the old Tate ten or so years ago. Life size, L'Ouragane and her fellow L'Orage loom like the undead from the underworld, a pair of horror movie scene - or body - stealers. But in 1948 zombies hadn't really landed. Their heyday, when they would seem to be in every high street picture house, was yet to come. The pair emanate, not from on-screen schlock, but from the real horror and nightmares of the Second World War. Brother and sister, or soul-mates, they are the robust cousins of Giacometti's more familiar figures, gnawed away by anguish. So what are Hurricane Woman and Storm Man about? Fleeing the scorching winds of the inferno (fire-storm man) or elemental force of nature come to purge the soiled land? Blinded by the toxic smog of war; or looking out for a new dawn? Which is it: welded immobile to the fused earth or stepping forward with resolute determination? And are they the last spectators at the extinction event, or Adam and a maybe pregnant Eve reincarnate? Ambiguous. And even if she had known the answers, Germaine Richier couldn't tell us now. She died, too early, of cancer fifty years ago. 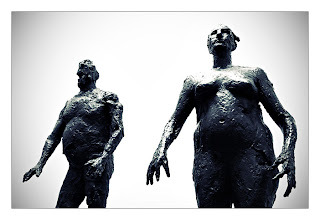 But as a sculptor of existentialism she moves me. She is one of my artistic heroes. With humility, I am a-mused. And the reason she appears on this blog is that she also did a chess set - or the pieces of one at least – in her last years. There are two versions. One in polychrome plaster is at the Tate, but languishing in the bowels of its vaults at the moment, and the other, cast in plain bronze and en plein air for all to see, is in Paris, in the Jardin des Tuileries. These are hardly things of beauty, and though not horrifying they are a touch unnerving and disquieting. 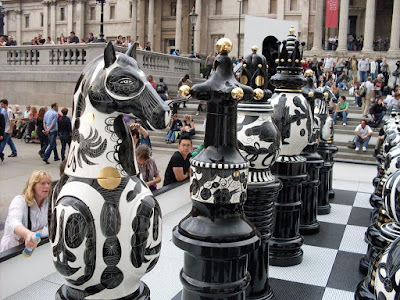 In this picture they have, one supposes, been arranged according to some aesthetic order loftier than the mundane dictate of the chess board because on the left is the Fou (bishop). Hunch-backed he/it has just hobbled over from Notre Dame; then comes our Dame herself, in gaudy finery and equine haughtiness, brandishing her regal appendages with little decorum and some menace; the Tour (rook) bears a Gaudi carapace scuttling on a tripod undercarriage; the bronze Chevalier hints at a demented ostrich mean enough to peck out your eyes; and finally behold Le Roi! Calliper-fisted (mimicking the Queen's armoury) he threatens to separate you from the rest of your tender parts. They are not happy bunnies, and they are more, much more, than impish hobgoblins. They are part of a tradition that manipulates the simple innocence of toys and playthings as a mask for the sinister and malevolent. They come from a bestiary of the grotesque and evoke feelings of unease as with all things misshapen and malformed. Play with these pieces at your peril; you might be abused. "Amused/abused" may be a bit off-colour but, straying off-piste for a paragraph or two, it takes us into Freudian never-never land where fantastical explanations wander about forlornly in pursuit of lost causes. Was Madame Richier aware of the psychoanalytic reading of the castrating King? Reuben Fine discourses at length on this in The Psychology of the Chess Player (1956/1967). For yes, chaps, the King represents one's father in the Oedipal struggle, and in the "profuse phallic symbolism of chess", the King is the big one (forgive me) though he might collapse under the weight of the psychodynamics that, according to Fine, he has to bear when played with: re-arousal of castration anxiety; narcissistic conflict resolution; and neutralisation of paternal dominance. No, I'm not sure what it all means either, though to be dismissive could be counted as evidence of some psychopathology or other from the litany of afflictions that beset us unsuspecting chess players if unlucky enough to find oneself male; according, that is, to Mr Fine. 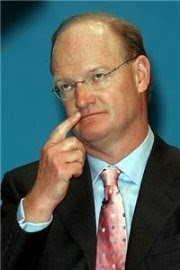 Though I wouldn't admit to it on the analyst's couch, I am not amused, and nor would have been my dear old dad. Spare the other pieces in Germaine Richier's chess menagerie a Freudian mauling. L'Ouragane, L'Orage and L'Échiquier fit into a Europe-wide strand of post-war sculpture that reflects on the human condition in those conflicted times, and which sometimes uses animal, and often avian references, for allusive affect. Our own Elizabeth Frink was a case in point, as was Bernard Meadows (currently sketchable at Tate Britain). 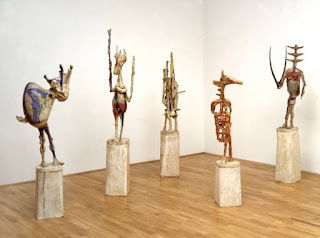 Meadows said he aimed to portray "vulnerability" in his work and perhaps that is the key to Germaine Richier as well: for all their massive presence Storm Man and Hurricane Woman are really lost souls. Reuben Fine, The Psychology of the Chess Player, Dover, 1967 is an unabridged reproduction of the work originally published in Journal of Psychoanalytic Psychology, volume 3, 1956. The picture of L'Échiquier comes from the Tate, and L'Ouragane and L'Orage separately from Tate Modern. At the time of writing (Summer 2009) there are two other works of hers on display at Tate Modern: Le Diabolo (1950) and L'Eau (1953-4). The picture of them both together comes from PBGalerie: Photoblog/museum. There is an interesting introduction to Germaine Richier at Germaine Richier: Tradition and transition, sacred and profane (Sarah Wilson, Courtauld Insititute of Art) which explains that the model for L'Orage was the same as for Rodin's The Kiss, unlikely though this would seem. 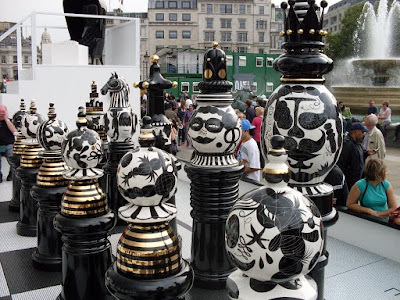 A couple of days ago we saw how the S&BC's Art Correspondent Martin Smith adopted Muhammed Ali's rope-a-dope tactics to win his game with the giant chess set in Trafalgar Square. Well, they say that modelling yourself on those who have already succeeded is a good path to follow for those who want to get to the top and today we'll discover how everybody's favourite Sister Wendy impressionist also borrowed a strategy from one of the greatest names in chess history. Have a look at the photo that led off our coverage on Wednesday. If you know Trafalgar Square at all you'll know that this picture was taken from the steps leading down from the National Gallery. We can see the board and the players in their towers - Martin in the Black chair on the right and Ian Henderson in the White chair on the left. Now imagine you're playing White and think of what it is that you'd be seeing if you looked directly in front of you. 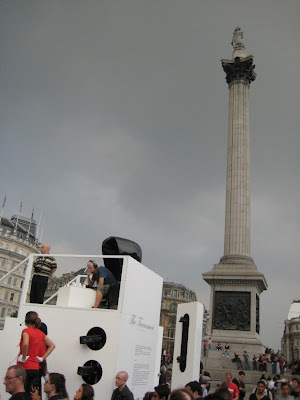 I think you'll agree that you'd be staring directly at the fourth plinth. 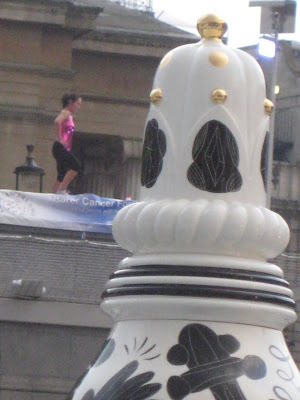 That fourth plinth that just 'happened' to be hosting a woman taking an aerobics class. I think it was Ruy Lopez who counselled his students to ensure that whenever they played chess they should ensure the board was placed in such a way that the sunlight would shine directly into their opponents' eyes. Whether the old Spaniard had anything to say about women bouncing up and down in spangly leotards I'm not entirely sure but I imagine the effect is much the same as he intended. focus ... focus ... oooh what's that? My suspicions that Angus AF may have become distracted were confirmed when I saw the next video clip he'd taken. Was it just a 'coincidence' that such a display just happened to be going on at the exact time that Martin's game was played? 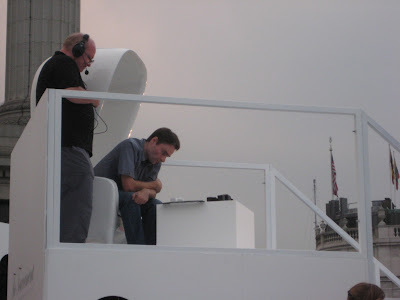 Did it just 'happen' to be the case that Martin's opponent was sitting in such a position that the fourth plinth was directly in his line of sight? Was something underhand going on? 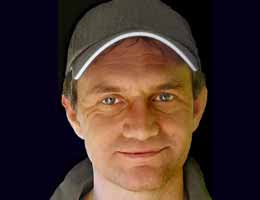 You may think so, I couldn't possibly comment ... but I will say this: Martin is yet to deny it. 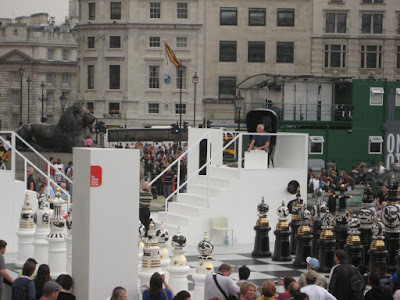 To end our brace of posts on the chess in Trafalgar Square we offer you some photographs taken by Martin himself. Rumours that these are pre-games shots taken to ensure that the board had been set-up in precisely the right position are thus far unsubstantiated. Thanks to Angus French for this and all other photographs/video clips in today's blog. Poor old Nelson had his back to it. A chess spectacular, surely the nearest thing yet to chess as a spectator sport: the huge six foot pieces, glinting in the fading sun, dragged mercilessly around the board; the glowering storm clouds answering the blood and thunder of the game; the commentary like a fairground prize fight; the tourist throng uncomprehending the chess but relishing the visual drama as the game lurched from full board to just three pieces left standing: sharp opening! sacrifice! combinations! discovered check! attack the Kings! passed pawns! promotion to Queen! spots of rain! passed pawn against a rook again! sixty five moves! mate! 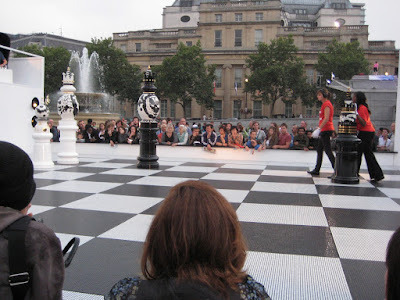 Drama and farce when the f pawn made it to promotion and the bewildered but forgiving staff had to wheel the black queen back on to the board, only for it to be despatched forthwith; oh, and the final act looked a picture, too – after an hour and a half of hand to hand combat a minimal mate in a remote corner of the board. It was one of those games where it’s a shame that someone won, and if my opponent ever reads this (Ian Henderson of Leeds University, a really nice chap) I’d like to say thanks for the game and for taking part in something that felt, to me anyway, as if (forgive the analogy) one was a pawn in a game of a higher deity who, a bit bored that Saturday afternoon, stooped to lay on a bit of entertainment for the earthly mortals. It was hardly a flawless game (to put it mildly) but it could have helped London’s tourist appeal no end. 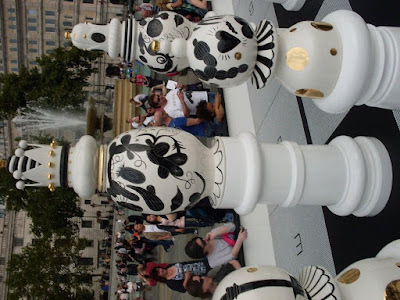 I read T.C’s announcement of the giant chess set to be placed at the foot of Nelson’s column back in August but I must admit I didn’t really pay it much attention at the time. 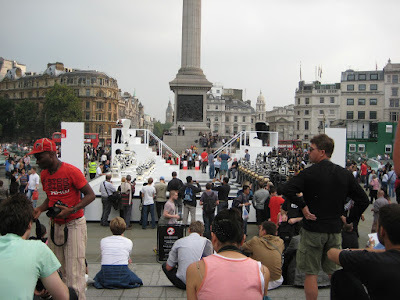 It was not until I rolled passed Trafalgar Square around midnight last Thursday and saw the board and pieces lit up, a truly spectacular sight, that the event caught my interest. When I received an email from the S&BC Blog’s Art Correspondent Martin Smith the following day saying that he’d been selected to play a game with the outsized pieces I immediately promised my support. I was sure that Martin would win at a canter. In fact I was so confident that he would be paired against some no-hoper who barely knew how to move the pieces that on arrivial I immediately abandoned my self-appointed position as Chief Second and disappeared to the pub for a swift pint to fill the half hour before the game began. I got back a few minutes after kick-off to see White whipping out 7. f4 and 8. Bb5+ against a Benoni and my expectations of an easy ride immediately vanished. Martin was obviously up against an experienced opponent and was under pressure from the start. A knight soon disappeared with Martin only getting a pawn or two back in return, but then, even with our worm’s eye view of the board we could see that that pawn cover around White’s king had disappeared. Blunder or sacrifice? A bit of both perhaps but either way it was clear that Martin was in no mood to recapture the material when given the opportunity, spurning first an exchange and then a knight in a bid to keep his remaining pieces active. He played with spirit but yet even the most biased of observers had to admit that the course of the battle was not going Martin’s way. 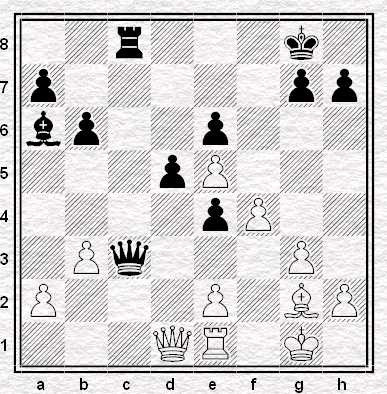 White defended well and when the queens were forced off the prognosis looked as gloomy as the London skies. The hour allocated for the game was almost up and Angus suggested Martin's best chance might be to play for rain … but the heavens refused to open and our guy was on his own as the crowds looked on. A flurry of exchanges left Martin a clear rook down. He had one haymaker left in his locker – connected passed pawns on the fifth – but it was impossible to see how he was going to be able to use it. He was on the ropes and taking a pounding. The end looked nigh. And then came the miracle. White followed an extremely risky attempt to grab another pawn with a hasty king move leaving his chin dangerously exposed. The greatest don’t need second chances and within the blink of an eye Martin delivered the knock-out blow. His dangerous pawns rolled down the board to leave White sprawled on the canvas, the return of the extra rook to prevent Black making a new queen was just the desperation of a defeated man being counted out. 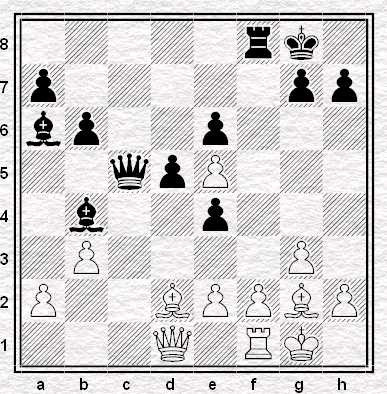 The subsequent ending was a trivial win for Martin since his last pawn was going to queen while White’s could not. The mate was just a formality. 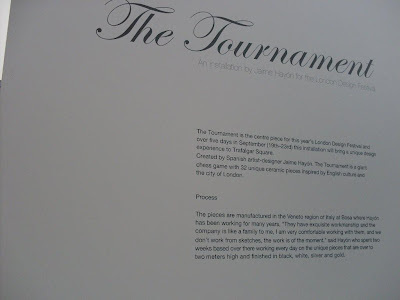 It’s was a great exhibition and a marvellous way to spend an hour and a half. It didn’t matter that the commentary was entirely redundant. It didn’t matter that the references to bishops on d4 and pins on f6 were entirely pointless - non-players having no idea what d4 meant and regular pawn pushers not really being able to see what was going on anyway. 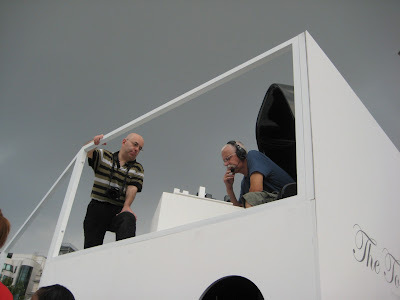 It didn’t matter that the PA system for the commentary was barely audible unless you were standing right next to the board nor that it was regularly drowned out by a street performer doing his stuff 50 yards away in the piazza in front of the National Gallery. It didn’t even matter that the commentary was delivered with all the passion of men auditioning for a job reading Radio 4’s shipping forecast. What mattered was the spectacle. 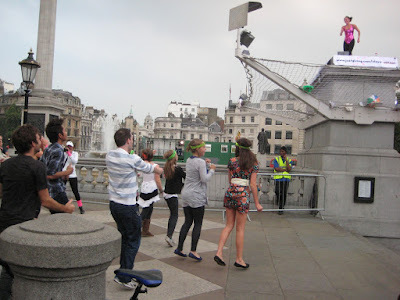 I overheard countless conversations from tourists and Londoners alike who’d wandered over to see what was going on. Do their companions play chess? Did they know the rules? Did they like the game? 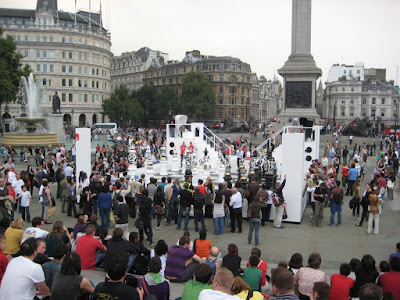 That is what people were talking about in Trafalgar Square last Saturday evening. The numbers watching were a clear testament to the success of the event, but will it lead to more people actually playing chess, either casually or even joining a club or entering a tournament? Maybe, maybe not but it certainly can’t have done any harm ... and next time I shall make sure my own name goes into the hat for people wanting to play. ... it's hard to do aerobics and take photos at the same time but Angus managed it. Rockall, Malin, Hebrides, Bailey. South or Southwest 5 to 7. Increasing gale 8 at times. Moderate or good, occasionally poor later. For players such as myself, who put the rank in rank amateur, scalping titled players is about the extent of our chess dreams. And lo, at only the gazillionth attempt, I have beaten an International Master. Yes, in a serious tournament game - not a friendly or on the internet, yes where money was at stake, potentially; no, he wasn't drunk, isn't decrepit, doesn't have a triple-digit age . . . so why aren't I jumping for joy? OK, I have to finally tell you. There is indeed a but. But, it was only a rapidplay event. They all count, except those. And there are no others, not in my case. Still, I enjoyed the game itself, especially before I looked at it with Rybka. Here it is. How did the rest of the event go? Well, I beat two weaker players, drew with a 235 ECF (2331 Elo) FM, and . . . lost to two juniors. Actually I can't remember the last time I beat a junior. Is it just me who looks at a tournament chart and shrugs at the FMs, IMs, and GMs written against the top names - only to shudder like a skeleton on a rollercoaster at all those JNRs instead? Perhaps my new chess dream should be to actually win a game versus a child, or even just somebody younger than me. Ah, the consolations of internet comedy! Not that for all its agony I'm tempted to give up chess for such untorturous amusements. Having not played seriously over the summer at all, the effect of the tournament on my mental alertness is obvious: as I write this the next day, I feel like I've had espresso beans injected into my eyeballs. I'm starting to think those who say chess staves off alzheimer's may be right - now that I am actually starting to think again, that is. One thing I didn't have to think about for very long was the advert from chessgames.com on the right. Can you play like Tal? it asks. To which, Of course I can is the answer we can all give. Think I'm joking? But it's easy. 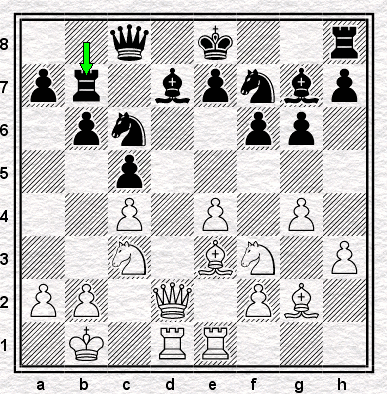 All you need to do wait for your opponent to castle, then castle the other side, point your bits at the enemy king, never move your knights backward, sacrifice all but the three pieces required for mate, and drink vodka for the first half of any tournament. It really is that easy to play like Tal. The difficulty is winning like Tal, and doing so against the world's best. Finally, haters of Boring Systems such as the Colle and Torre may be pleased to know I demolished one in twenty moves at the Richmond Rapidplay event. If only juniors were as avoidant of the mainlines as us older players, we might even stand a chance. Beth Harmon becomes an orphan when her parents are killed in an automobile accident. At eight years old, she is placed in an orphanage in Mount Sterling, Kentucky, where the children are given a tranquilliser twice a day. Plain and shy, she learns to play chess from the janitor in the basement and discovers that she is a chess genius. She is adopted by Alma and Allston Wheatley and goes to a local school, but remains an outsider. Desperate to study chess and having no money, she steals a chess magazine from a newspaper store and then some money from Alma Wheatley and a girl at school, so that she can enter a tournament. She also steals some of the tranquillisers to which she is becoming addicted. At thirteen she wins the tournament, and by sixteen she is competing in the US Open Championship. Like Fast Eddie (in The Hustler), she hates to lose. 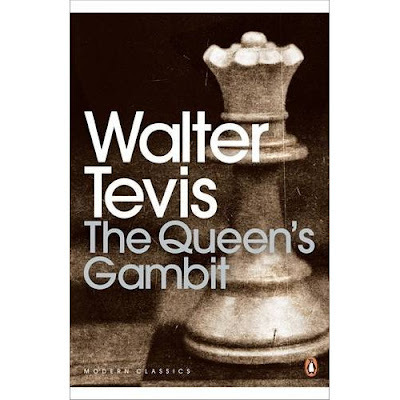 It must have been twenty years ago that I read Queen's Gambit. Certainly long enough for me to forget that it was written by the same guy who wrote The Hustler. Also long enough for me to forget everything that happens, which is why I picked it up second-hand for a quid from the bookstall at Paignton. King v Vicky the Viking, position after 3...Bf5?? 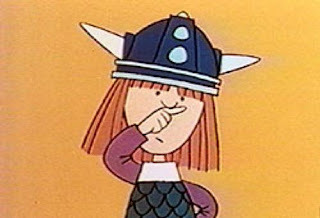 They're showing a lot of Vicky the Viking on TVE2 on weekday mornings, in between The Little Princess and - for some reason - The Animals of Farthing Wood. Although I am no longer a student, I do occasionally find myself watching these shows. I could try and justify this on the basis that I work with children and with children's books, and therefore need to know what adaptations los chavales are watching, but in truth it has rather more to do with my inabilty to culturally adapt myself to sports bulletins which frequently consist of little more than whatever Real and Barca did the day before at their training grounds. Hence, when I tire of seeing some tool on Telediario wearing what I imagine are fashionable glassses and smarming all over a couple of lads wearing flourescent bibs while jogging - which is often - I find myself parachuting out of TVE1 with the help of the remote control and into TVE2, at an hour when Vicky The Viking is in the middle of the first of its quotidian double-bill. For those unfamiliar with this veteran of the international cartoon circuit, Vicky is the son of a Viking chief and accompanies him and his men on their expense-free-shopping trips abroad, in the course of which, naturally, all sorts of adventures and scrapes arise. Though good at fighting they are not very good at anything else, especially thinking, and Vicky is, therefore, not too hard pushed to establish himself as the brains of the gang. This, I imagine, may help to explain how it was that when I turned over to TVE2, a couple of weeks ago, I found myself looking at a chessboard, with the pieces in the starting position, the king of somewhere or other on one side of it and Vicky, rather than any of his grown-up friends, his opponent. As it turns out, despite being thoroughly outplayed Vicky takes advantage of a complacent opponent and spots a back-rank mating opportunity for his rook on e1, which chance he takes to win the game. Hurrah! Hurrah, except that, as I said above, I turned on with the game - but not alas the episode itself - about to start. And so I don't, actually, know why it is that Vicky comes to be playing this game in the first place. What is the nature of the challenge? Who has claimed what? What is at stake? I may never know. I have slept, since watching the half-episode I saw, several times, untroubled (as I am usually untroubled) by my ignorance, but even so, I would like to know why. So, should you happen to know, there is a comments box below. Much obliged. Anyway, seeing as Morgan opened the week with Alfred J Kwak I thought I'd bring it to a close with Vicky the Viking. Hey hey Vicky, hey Vicky hey. "I don't actually like playing chess"
So said my friend and fellow blogger Morgan Daniels last Sunday. I'm not sure I'd agree with him entirely but certainly I think chess must be one of the most frustrating games to play. 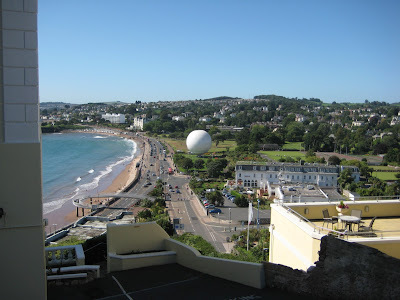 Take the Paignton Congress which finished last Saturday. I ended up on 4.5/7 in the Challengers (u-180) section with a tournament performance rating of 174. That's a good 8 points above my new grade but I can't say I'm satisfied with the outcome, not even when I take into account the fact that I had a pretty tough draw. I played all of the top three finishers - I believe I was the only person who did so - and also had games against one of two winners of the 154-161 grading prize, the winner of the u-154 grading prize and the winner of the slow starter prize. Six of my seven opponents took home prize money while I won precisely bugger all - which is why I'm not particularly happy with my +2 result. I had started very well, reaching four out of five, but then rather collapsed. Far from being pleased with my performance all I'm seeing is a missed opportunity and a 4th equal finish that 'should' have been a share of second place at worst. Such is the nature of tournament chess I suppose. the last round 9:30am start did not suit me to say the least. Higher up the food chain the Open was won by Keith Arkell and our own Angus French, to whom we are indebted for the photographs in today's post, secured a share of the grading prize with 4/7. 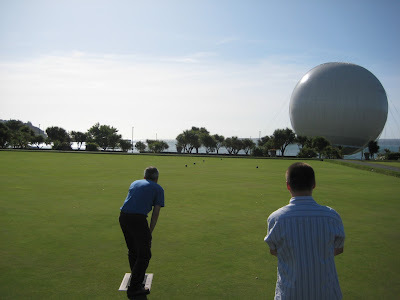 My poor finish notwithstanding, I have to say that the tournament was well run in pleasant conditions and I very much intend to return for the 60th Paignton Congress next year. Here's one of my favourite games. Immediately afterwards I was rather pleased with the way I had consistently prosecuted a long-term plan of pressuring White on the queenside. Needless to say, it didn't take long with Fritz to see that actually I hadn't played very well at all! Like I said, chess is just inherently frustrating. Here I played 16 ... Nxe5, 17 dxe5 Bb4, 18 Rf1 Rxc1, 19 Bxc1 Qc5 to gain control of the c-file, the sequence based on the fact that White Queen cannot recapture on c1 because Black could then take on e2. It's a decent plan but Black has a much better idea available. In this position I played 23 ... e3 with the idea of a future ... Qd2 when White can't take because of ... exd2 and ... Rc1 when Black will make a new queen. Again it's not a bad plan but once more there's an immediate win there for the taking. It's a slightly tougher tactical sequence than the previous example but still well within my capabilities and I should have spotted it. This one's less clear cut. I swung my rook over to c8 but perhaps there's something better here? I'm not sure. It was definitely another tactical sequence that I missed but perhaps here it's not so much driving home an advantage as much as forcing White into a worse but possibly drawable ending? It wasn't all chess last week. 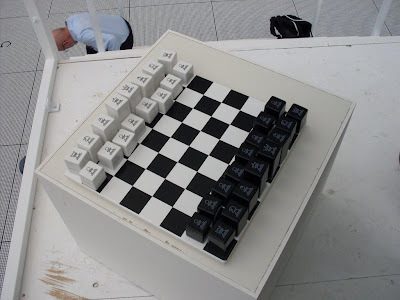 How to beat your chess computer . . . 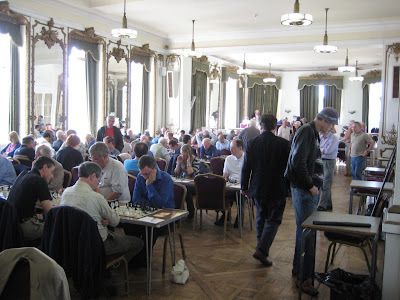 If you are planning to play just one chess tournament this side of Christmas you ought to consider the 27th Bury St Edmunds Congress, which takes place during the weekend of 31 October/1 November at the Corn Exchange. One of the joys of the Bury Congress is its organisation: Bob Jones, the Don Vito Corleone of West Suffolk chess, runs his tournaments as efficiently as could be, pairing, re-pairing and arbitrating freely, thus eliminating that dispiritingly overwhelming sense, so familiar to the competitive chess player, that one is participating in a shambles-come-farce and that there is nothing one can really do about it. Unlike in recent years, the 2009 Congress does not clash with any other UK tournaments, so it can be hoped that the field - which always contains at least four or five titled players - will be especially strong. And if it as any sort of plus point there is likely to be a decent Streatham and Brixton contingent there this year, too. 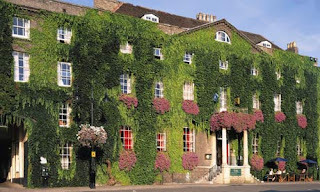 Just round the corner from the Corn Exchange is the Angel Hotel, in which Dickens wrote part of The Pickwick Papers and where, more significantly, Streatham & Brixton's Antony Hall stayed the night before his wedding last year. 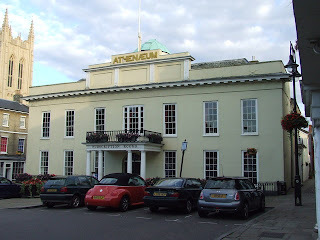 The Athenaeum, home to a Capablanca simul in 1919. 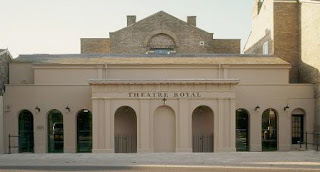 The Theatre Royal, now quite the thing of wonder after a two year project, culminating in September 2007, to restore the building to its original 1819 self. 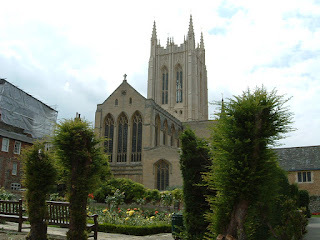 Bury Cathedral, complete with Gothic revival tower. 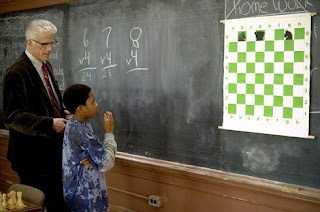 Roland Kensdale has been in touch to say that in the early hours of tomorrow morning (1.10am, to be precise) Channel 4 will be screening Knights of the South Bronx, a TV movie about an inner-city school teacher (Ted Danson) who teaches his students to play chess. If you've got half a bottle of wine left and the valves of your telly are still warm after watching Derren Brown explain how he used a split-screen mix of magic, suggestion, psychology, misdirection and showmanship to predict the lottery numbers, it might be worth tuning in for five minutes, if just to see Sam Malone set unknowing children impossible mate in two puzzles. I don't remember exactly where I first saw this game, but judging from the comments on Chessgames, I have a suspicion that it may have been in Andrew Soltis' The Art of Defense In Chess , a book I read, many more times than once, in Stevenage Central Library when I was young. I wish I had a copy. I was reminded of this game only the other day, having just acquired O'Kelly de Galway's old Pergamon book on Petrosian. It doesn't have the Pomar game (as it was published five years before Siegen, that would have been a little too much by way of anticipation) but by one train of thought or another, musing on how much I like Petrosian's games, I remembered this one, where Petrosian seems to win not just by doing nothing, but by doing nothing sensible. The game was played in the Second Preliminary Round in a match which the USSR won 3-1. I don't know what precisely induced Petrosian to play this game quite the way he did: he could be provocative, but not, generally, quite as much as this. But noticing that the 1 was the result of Korchnoi oversleeping, I'm tempted to view the first board game in the same light, with Black playing, as long as possible, as if he were asleep. Certainly he plays as if unaware of his opponent. The fifteenth move, in which he shifts his rook to a square whose only obvious relevance is that it's on the same diagonal as White's g2 bishop, is one of the most remarkable I've ever seen. If the point was to baffle Pomar, Petrosian surely succeeded, but you have to be world class to play like that without baffling yourself. If I tried it, I'm sure I'd lose in twenty moves. Not Petrosian. He plays as if asleep, but Pomar sleepwalks all the way into a smothered mate. 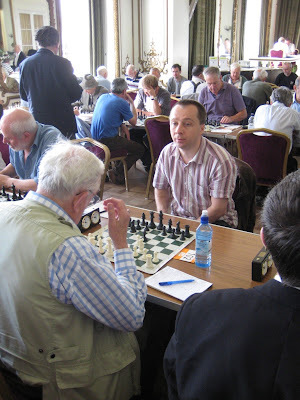 Peruse Streatham and Brixton Chess Club's history books, and you'll find many familiar names occupying the top of the team lists. Indeed, a few years ago the Firsts in the London League saw Board 1 appearances from International Masters Eddie Dearing and Susan Lalic - whilst head back to the early 1980s and you'll see that Grandmasters Julian Hodgson and Glenn Flear won the Club Championship. But of all the Streatham & Brixton Chess Club players who've had their names up in lights, surely one out-shines them all. He played for the club in the 1960s when still a school boy, scoring for the First Team an awesome 82% - and went on to become England's second ever Grandmaster; he's organized a glittering array of events, from Staunton Memorial Tournaments to World Championships, and he's written countless articles and over a hundred books on chess. That player is, of course, none other than Raymond Keene. And did I even mention that he has an OBE for services to chess? Now that's not to say that Ray has forgotten his old club. 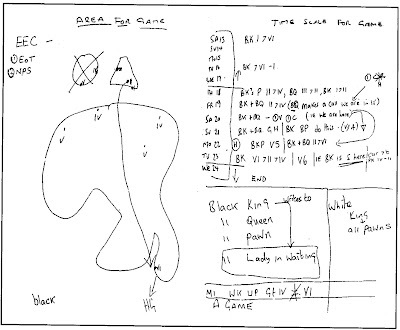 Quite the contrary: in fact Ray has kindly sent us never-before-published annotations of one of his wins for S&BCC. The game was played in 1967, and to this day his opponent remains a force to be reckoned with on the London club scene and UK tournament circuit - none other than well-known FM Michael Frankin. And what a good game it is - also, in fact, to be featured in The Spectator later this week. Thanks Ray for sending it our way first! Today I want to take you back to the Coulsdon u-130 from the year 2000. I admit it's not a tournament generally regarded as matching Hastings 1895 or Zurich 1953 in terms of its historical importance but still I'm rather fond of it. It's the one exception, you see, to my quarter century or so of winning precisely bugger all at the chess board. while he may once again be Britain's No. 1, he's never won a grading limited event at Coulsdon. Then, as now, I was rather in the habit of acquiring good positions before mucking them up. That weekend at Couldson, though, things went the other way and I managed to arrive at the last round a point clear of the field on 4/4 despite being easily lost/lost/probably lost/absolutely lost-there's-no-way-I'm-getting-out-of-this* in rounds one to four respectively. 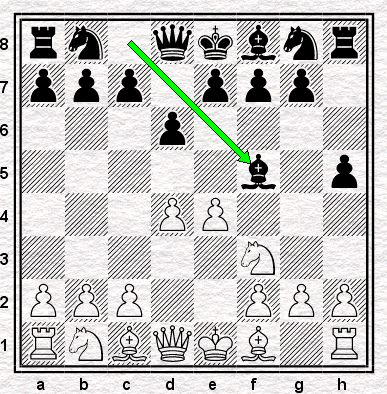 In the last round my opponent played the French Defence and of course I headed straight for a TIFE. I would perhaps have been rather worried about the game ending up like Gurevich-Short, Manila 1990 were it not for the fact that my young opponent had clearly not been born when that game was played. Indeed, I rather doubted she'd arrived on the planet in time for the Kasparov - Short, Championship match in 1993! I offered a draw around about the time we castled but to her credit my opponent demonstrated considerably more fighting spirit than your cowardly blogger and turned me down. Unfortunately for her she immediately went wrong and the game didn't last much longer. Showing a fine sense of timing she offered me the draw back and it didn't take me too long to accept. I could see I was now winning - e.g. 19. Ne5+ Kc7, 20. Ng6 Rf7, 21. Rxe6 - but I quite fancied spending the afternoon in the pub so I shook her hand and headed out of the tournament hall to find the nearest place to buy a drink. 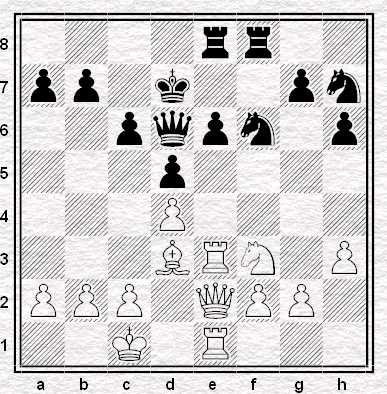 In fact White can win rather more than a pawn in the final position. Would I have played on had I realised that at the time? I rather doubt it. I like to think it would be different now but back then I imagine that I would have wanted to avoid my own low-rent version of Bill Hartston's story at any price. Play on or head for a celebratory pint? I've rather rested on my laurel ever since I took that draw and haven't played any tournaments - save for the Kings Head Rapidplay last year - for quite a while. The reason for mentioning all this now? Well thanks to Angus French's encouragement, and indeed his driving, I'm coming out of retirement and will be playing in Paignton next week. I'm hoping this revisiting of what pass for my chess glories will bring me good luck. We'll see how it goes. * A piece down for a long time in this game, I managed to win only after my opponent (then very young but subsequently reaching 2100+ elo) put a rook on g4 then failed to move it after I played h2-h3. I've been looking up Ray's books, for one reason or another, on the British Library Integrated Catalogue. There's a lot of them, as you might imagine: as you might not imagine, though, the Library's list appears to be very far from complete. The current total - and one that is rising all the time - of the chess books Ray has authored stands at, if Ray is to be believed, 140, yet there are far fewer entries than that for Keene, Raymond D. I locate 113, not all of which include him as an author and not all of which are about chess. In the latter category, for instance, we find books like The age heresy : you can achieve more, not less, as you get older, written by Tony Buzan and Raymond Keene. Maybe you can, Ray, maybe you can. Especially if you redefine what you mean by "achieve". Moreover, that 113 doesn't mean that 113 separate titles are listed, since sometimes separate editions have been received, and catalogued separately. One notices, for instance, five different entries for An Opening Repertoire For The Attacking Club Player, which as I recall is four more than the number of times I played its recommendations. Publishers and distributors in the United Kingdom and the Republic of Ireland have a legal obligation to send one copy of each of their publications to the Legal Deposit Office of the British Library within one month of publication. Perhaps there's a backlog: I've worked as a library cataloguer and I wouldn't be at all surprised. It would have to be a backlog, though, in line for a Guinness world record entry in itself, since as far as I can see - with a couple of exceptions, which I shall get to later - no item is listed, giving Ray as an author, since 1999. This was a Batsford reissue of Aron Nimzowitsch: A Reappraisal, the same publisher having issued the next-most-recent entry, the 1998 Learn from The Grandmasters, of which Ray was the editor. So Batsford sent these volumes some time before the twentieth century expired - and since then, effectively, there's been nothing. Is there a ten-year backlog in Cataloguing at St Pancras? Or has there just a ten-year hiatus in supply? It seems, unless I am mistaken, that since at least 2000, Ray's books have no longer been sent, as the law requires, to the British Library. As it happens, this period would roughly correspond with the period in which Ray's books have been issued by his friends and by himself: through Hardinge Simpole and through Impala. 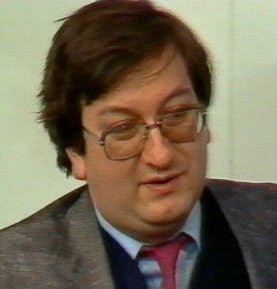 You know, you'd think somebody so proud of his world record output would want to be sure that every book he'd written was preserved in the British Library, for inspection and posterity. You'd also think a man - a businessman, indeed - as respectable as Ray would want to be sure his companies adhered to long-established and uncontroversial law. Or perhaps Ray, despite a forty-year career as writer and publisher, is unaware of the law as regards legal deposit. Just as he is apparently unaware of the law as regards unauthorised copying. Or maybe he just forgot. He often does. But what of those exceptions? One of them is the 2005 Buzan's Book of Mental World Records, of which Ray is listed as an author, after the aforementioned Tony Buzan. But that book was published by D&B Publishing, whose adherence to the law of legal deposit is perhaps a little more rigorous than certain other companies' - or perhaps they have somebody with a better memory in charge. At any rate, it was the same company, D&B, who published the only other item held by the British Library, and published this millennium, of which Ray is listed an author. 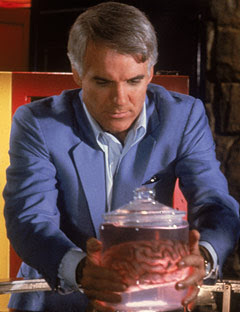 It's by Ray Keene and Byron Jacobs: the title is Two Brains.